Technology hurdled forward during World War I, and when you load up Battlefield™ 1 on October 21 (or October 18 if you pre-order the Battlefield 1 Early Enlister Deluxe Edition*), you'll have access to the vehicles that absolutely revolutionised modern war. Want to know more about them? So does PonyLion_HD, popular YouTuber (and Battlefield GameChanger). He asked Senior Designer Patrick O'Shaughnessy some questions about the vehicles. Check them out in the other tiles on this page, and scroll down for even more reasons to get excited to experience the dawn of all-out war. PonyLion_HD: How do the mounted gunners work in planes? Patrick O'Shaughnessy: In the two-seat attack planes, the rear observer position uses a mounted MG on a 360 degree ring mount. Bombers also have a rear gunner, but the traverse is limited to rear-facing angles. Additionally, Bombers have a third position in the nose of the plane, with a slightly heavier weapon on a forward-facing limited traverse. PonyLion_HD: How is the dogfighting in Battlefield 1 different from previous Battlefield air combat? Patrick O'Shaughnessy: The biggest difference is the lack of locking missiles and countermeasures. Aside from that, the aerodynamics model we’re using is more nuanced and refined than we saw with jets. The airplane was a new technology during this period, and these machines had to do a lot of work to fight gravity. To capture that physicality, we focused more on the feeling of weight and drag and how to express that in our planes. If dogfighting with jets was about pressing a button when you heard a beep, dogfighting with these machines is more about maneuvers, speed, and throwing bullets towards your target. PonyLion_HD: Will the tanks operate as a multi-person vehicles, or can the driver be able to drive and do all the shooting? Patrick O'Shaughnessy: This varies across the range of tanks we offer. With the landship tank, for instance, the firepower comes from its two gunner weapons on either side of the vehicle. This is quite different from how we’ve seen tanks in Battlefield games, where the driver operates the single big gun. We saw this tank as a perfect opportunity to provide a teamplay-based armored vehicle class that we’ve never done before. PonyLion_HD: Will the planes of Battlefield 1 be effective against the ground vehicles? Patrick O'Shaughnessy: Across the three plane classes, certainly some of the available loadouts are effective vs ground. Likewise, some are focused on air-to-air, some are better at suppressing infantry, and some are focused on... other targets. Pilots have a wide range of options to fit playstyle preference or strategic options. From light tanks to landships and motorcycles, the ground game in Battlefield 1 provide plenty of variety. The same goes for the battles at sea, where you'll be able to captain fast, agile torpedo boats and an armored landing craft. And if you want to take to the sky, there's plenty of different types of air vehicles to choose from. You'll be able to fight for control of the skies in nimble fighters, squad up in two-seat attack planes or suppress foes on the ground with devastating bombers. 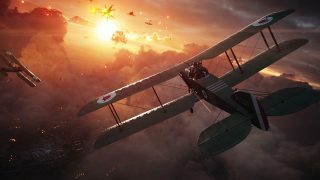 World War I saw the birth of dogfighting, and Battlefield 1 brings some of the best aerial combat in the franchise's history. What's better than chasing an enemy plane and blasting them out of the sky? Having your squad up in the air with you. Some of the planes have spots for gunners, something we know Battlefield 1942 fans have wanted to see for a while. Battlefield 1 includes some of the largest vehicles in Battlefield history. If you watch the trailer you can see some in action, and we'll have more to say about these in the near future. Once your plane, tank, or boat has taken enough damage, you'll start to see an impact not just on how it looks, but how it feels. Shooting at airplane wings, for example, can cause them to break and splinter, altering the aerodynamics of the plane. In the same way, destroying the gun stations on a tank will disable those weapons until repaired. Know how you get to choose which sniper rifle you want to use when spawning as a Scout? The same goes for the type of vehicle you want to pilot when spawning as a Pilot or Tanker. 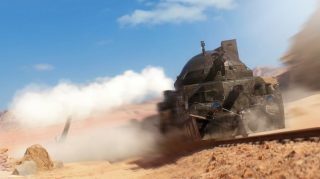 On maps and modes with these vehicles, you'll be able to pick whichever tank or plane you want, letting you choose the right vehicle for the right situation. When you decide to spawn as the Tanker or Pilot Vehicle Class, you'll have the ability to choose your vehicle and its loadout. Each has a different weapon setup, equipment, and sometimes even different passenger setups as well. Any Class can still use any vehicle, but Tankers and Pilots will let you focus on vehicular combat. Airplane aerodynamics feel more physical than in previous games; you really feel gravity and you can even perform controlled stalls. Tank tracks easily climb over most objects now, and can drive through buildings like a warm knife through butter. Watch as DooM49 tries out tanks from the EA Play demo. ponylionHD takes to the sky with the planes available at EA Play.